I heard from many readers last week who were curious why I had not weighed in on the massive (and apparently still unfolding) data breach at the U.S. Office of Personnel Management (OPM). Turns out, the easiest way for a reporter to make sure everything hits the fan from a cybersecurity perspective is to take a two week vacation to the other end of the world. What follows is a timeline that helped me get my head on straight about the events that preceded this breach, followed by some analysis and links to other perspectives on the matter. OPM offices in Washington, DC. Image: Flickr. July 2014: OPM investigates a breach of its computer networks dating back to March 2014. Authorities trace the intrusion to China. OPM offers employees free credit monitoring and assures employees that no personal data appears to have been stolen. Aug. 2014: It emerges that USIS, a background check provider for the U.S. Department of Homeland Security, was hacked. USIS offers 27,000 DHS employees credit monitoring through AllClearID (full disclosure: AllClear is an advertiser on this blog). Investigators say Chinese are hackers responsible, and that the attackers broke in by exploiting a vulnerability in an enterprise management software product from SAP. OPM soon suspends work with USIS. 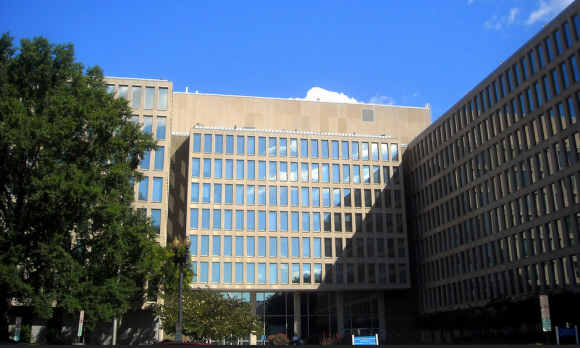 November 2014: A report (PDF) by OPM’s Office of the Inspector General on the agency’s compliance with Federal Information Security Management Act finds “significant” deficiencies in the department’s IT security. The report found OPM did not maintain a comprehensive inventory of servers, databases and network devices, nor were auditors able to tell if OPM even had a vulnerability scanning program. The audit also found that multi-factor authentication (the use of a token such as a smart card, along with an access code) was not required to access OPM systems. “We believe that the volume and sensitivity of OPM systems that are operating without an active Authorization represents a material weakness in the internal control structure of the agency’s IT security program,” the report concluded. Dec. 2014: KeyPoint, a company that took over background checks for USIS, suffers breach. OPM states that there is “no conclusive evidence to confirm sensitive information was removed from the system.” OPM vows to notify 48,439 federal workers that their information may have been exposed in the attack. Feb. 2015: Health insurance giant Anthem discloses breach impacting nearly 80 million customers. Experts later trace domains, IP addresses implicated in attack to Chinese hackers. Anthem offers two years of free credit monitoring services through AllClearID. May 2015: Premera Blue Cross, one of the insurance carriers that participates in the Federal Employees Health Benefits Program, discloses a breach affecting 11 million customers. Federal auditors at OPM warned Premera three weeks prior to the breach that its network security procedures were inadequate. Unlike the Anthem breach, the incident at Premera exposes clinical medical information in addition to personally identifiable information. Premera offers two years of free credit monitoring through Experian. May 2015: Carefirst Blue Cross discloses breach impacting 1.1 million customers. Clues unearthed by researchers point to the same attack infrastructure and methods used in the Anthem and Premera breach. Carefirst offers two years free credit monitoring through Experian. June 2015: OPM discloses breach affecting up to 4 million federal employees, offers 18 months of free credit monitoring through CSID. Follow-up reports indicate that the breach may extend well beyond federal employees to individuals who applied for security clearances with the federal government. That quote aptly explains why a nation like China might wish to hoover up data from the OPM and a network of healthcare providers that serve federal employees: If you were a state and wished to recruit foreign spies or uncover traitors within your own ranks, what sort of goldmine might this data be? Imagine having access to files that include interviews with a target’s friends and acquaintances over the years, some of whom could well have shared useful information about that person’s character flaws, weaknesses and proclivities.